The purile amongst you may enjoy pretending that the player’s blob does loads of purple shites after eating monsters. What would Pac-Man look like in reverse? Going by the name Nam-Cap (DYS? ), this game takes what sounds like a four-pints-later pub conversation gambit and turns it into an actual videogame. 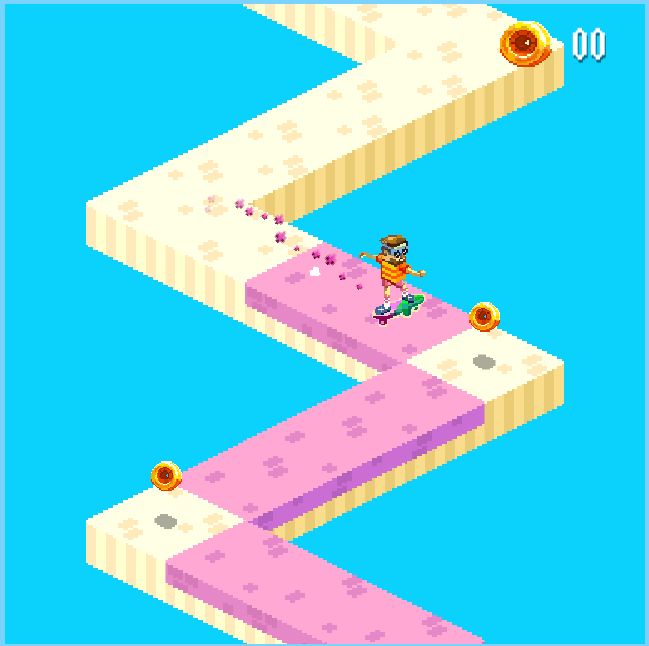 The player controls what can only be described as a blobby-thing which needs to fill an empty maze with dots. It has to eat the (harmless) patrolling monsters to keep laying the dots, and every time it eats a monster it leaves a heart which gives the monsters the power to chase and destroy our blobby hero should they collect it. Oh, and whilst the monsters are “powered-up”, the player character also starts eating any dots he moves over, like in the original Pac-Man. So are the fruits replaced with vegetables? Well, no, they’re replaced with wandering devils who kill the player’s character regardless. I’m not sure how this exactly an inversion but it works in the context of the game so let’s not think about it too hard, eh? Despite clearly having been designed as some kind of experiment and ironic nod to Pac-Man, Nam-Cap actually works quite well as a game and is, therefore, recommended for a spot of time wasting and high score beating. More information and links to where it can be played here. It’s moving at a terrific speed but it’s solar powered and environmentally friendly, Jeremy Clarkson would be so confused. Incredibly, two of my favourite pick-up-and-play games discovered in the last year or so have been web-browser based. First there was the excellently straightforward strategy title Hex Empire, now there’s Race the Sun, a fast-moving action racing game which owes more than a bit to the classic 8-bit title 3D Deathchase. 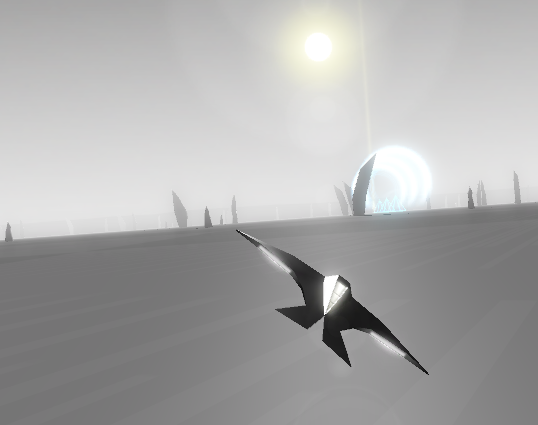 Based on the premise of a furious race against a setting sun in a solar-powered craft, gameplay consists of dodging dirty great pillars jutting out the surface of the planet said craft is skimming across and collecting pyramids for bonus points all whilst moving really, really fast. Clipping a pillar (and later, weird snakey things that look like they’ve recently vacated Space Harrier) will slow the craft down meaning it needs a few seconds to regain full speed whilst slamming into a pillar means Game Over. And when the sun sets, the craft sadly loses speed as it loses power until coming to a stop. Janey Thompson – we really want to see those fingers! It’s time for one of those ‘quick recommendation’ things I tend to do when I’ve not got a whole proper article to stick up here and that I largely post to show everyone that I’m not neglecting the blog (hello!). This time, it’s a rather-excellent pastiche on Channel 4’s E4 Games site which has been rather loosely based on the classic 8-bit sports title Daley Thompson’s Decathlon. Calling itself Janey Thompson’s Marathon it recreates the genuinely-uncomfortable button-bashing that made its inspiration notorious but, unlike DTD, expects you to do it for a long time. A very long time. In fact, about as long as you can manage before you start crying and push the keyboard away whilst nursing your poor fingers. Apart from the recreation of some of the ’80s most notorious gaming it’s also a brilliant recreation of arcade games circa 1984 from the graphics (complete with scanlines and colour-bleeding) down to the sound. Someone’s already demanded a MAME feature that does much the same thing. If you think your fingers can stand it, you can play the game here. I’m going to try and write-up a couple of articles about Christmas games in the run-up to the festive season but before then I want to do a quick plug for an excellent new browser-based game I’ve been playing called Minotaur China Shop. In it you play a minotaur with his own china shop who needs to fetch items for similarly-mythical clientel in order to sell them and make a profit. Being a minotaur, he’s rather clumsy and it’s easy to break stuff and therefore lose money. However, if you break enough stuff the minotaur goes into a rage and insurance kicks in meaning you have to break as much as possible to make money before security appear and fill you with tranquiliser darts. I’m not the biggest fan of browser games because they have a bad habit of either being far too simplistic or being style over substance but I really love this one. It has a simple, addictive old-skool type of gameplay and playing it is both amusing and fun as the poor minotaur moos with annoyance when his big clumsy fists knock over a shelf full of vases. Go on, give it a shot. It’s cheaper than wrecking real crockery.